So I was getting an “ Could not Load File or Assembly” error, even thou I was pretty certain I was referencing the right dlls in the correct folders. What could this error possibly mean? System.IO.FileLoadException: Could not load file or assembly ‘Moq, Version=2.6.1014.1, Culture=neutral, PublicKeyToken=69f491c39445e920’ or one of its dependencies. 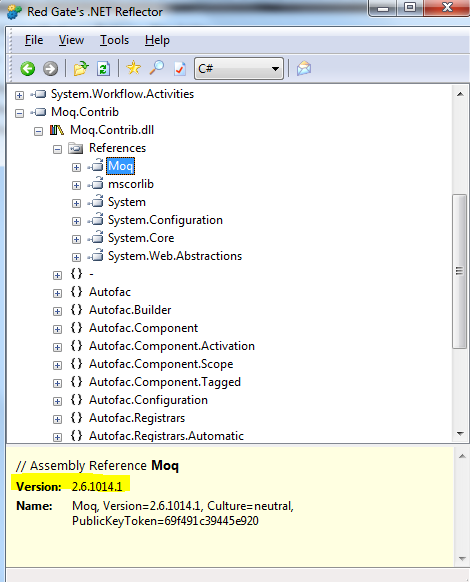 Maybe I dont have the moq.dll assembly, but it was there. Then I checked the assembly version, my moq.dll was 4.x (the error stated 2.6.x was required), so there is a difference in the expected versions, why? This means that moq.contrib.dll did indeed depend on moq, so I just needed to find a version of it that pointed to the right assembly, I was lucky because I had a set of dlls that work, if you are not so lucky, get latest from the moq.contrib google code and simply run the Build.cmd and you are all set to go (you can replace the moq.dll dependecy if they have moved on). Like this thread, basically it said that this was possibly a compiler bug. I thought damn a dead end, but it wasn’t :).